The 2015 April Fools day event featured a number of changes to RuneScape, including stackable Camels, giant chickens, an Amulet of yakspeak, a raven named Terry, the Jas Hands cosmetic override, Samuel LeBaux's rat killing tasks, and cow tipping. An amulet of yakspeak was added to the drop table of the Yaks on Neitiznot. It was a common drop and looked visually identical to the camulet. When worn, it changed all non-voice acted non-player character dialogue into variants of "Baroo baroo", which was voice-acted. The amulet was removed from the game at the conclusion of the day-long event. Several camels with the "Stack" option were placed in the desert north of Al Kharid. Choosing stack gave a chance for another camel to be added to the stack, or the camels to explode. Stacking one gave the message: "You manage to stack <number> camel(s) on top of the first...can you do more?". The amount of stacked camels capped at 4. A single, rather bored looking camel. He seems so lonely. Two camels, precariously balanced on each other. No human would stack camels like this. The top camel is trying to lick the clouds. Most cows and cow calves around RuneScape were dressed up and given a "tip" right click option. Tipping a cow gave the option to donate 10 coins, 100 coins, one thousand coins, a custom amount of coins, or nothing to the cow. Donating at least 10,000 coins at once resulted in a message stating that "The cow is overjoyed at your generosity!". Choosing to donate no coins resulted in a message saying that "The cow is saddened that you feel its service was insufficient to warrant a tip. You make cows feel bad...you are a terrible person, everyone says so." A hiscore table for the amount of coins donated to cows may be found here. After chickens were killed, they had a rare chance to respawn as gigantic chickens. These chickens had the same amount of health and stats as regular chickens, making it a simple cosmetic effect. A cosmetic gloves override called Jas Hands was given to all players who logged in on 1 April. To the north of Draynor Manor, a raven called Terry could be found, near the gallows. Spotting it caused the message You have found 1/365 ravens. I wonder what happens when you find them all? to appear. A man named Samuel LeBaux could be found between the Lumbridge General Store and Lumbridge Castle. He gave players quests to kill ten rats, over and over, to the player's frustration. The first nine chapters had unique dialogue for receiving and completing them, and the first thirteen tasks had unique names. Up to 300 tasks could be completed. A hiscore table for the amount of rats killed may be found here. In an update, a video was posted on the official RuneScape YouTube channel entitled LEAKED JAGEX TOUR!. The video description claimed the uploader had "hacked into the runescape account so everyone can see what really goes on at Jagex". The uploader also claimed to have been banned for posting the video, linking to a supposed screenshot. In the video, a Jagex Moderator bans two players at random, NXT is shown to have the graphics of RuneScape Classic, and a "new server" is shown to be secondhand and littered with trash. The video also shows a list of RuneScape updates for a few seconds, labelled 'APRIL 1st'. The list includes 'Cow Tipping - right click', 'Amulet of Yakspeak - common drop' and 'Teabag Emote'. The official RuneScape Twitter account linked to the video shortly after 1 April ended, saying "As #AprilFools is now over, we feel like we can finally own up". In the Twitch stream on 31 March, Mod Mark claimed that there was no April Fools content in the game. Camel Stacking appeared as a sample RuneLabs idea in Jagex's YouTube channel. ^ Mod Raven. "Samuel leBaux." 1 April 2015. Recent Game Updates Forums. "Congratulations on your dedication! 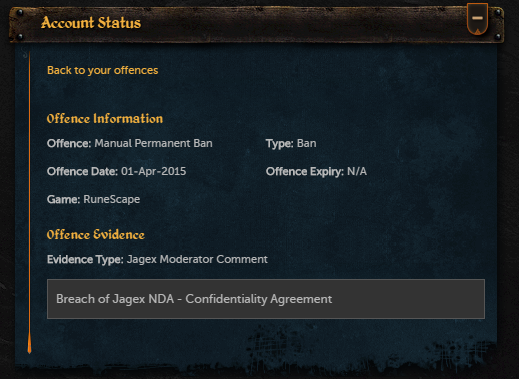 Although I confess we did decrease it from the original end...."
^ Jagex. RuneScape's Twitter account. 1 April 2015. RuneScape: "As #AprilFools is now over, we feel like we can finally own up." This page was last modified on 18 May 2018, at 18:01.